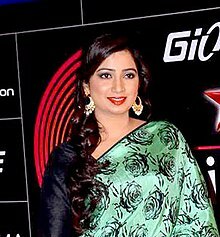 Ghoshal's work has been praised by music directors Ankit Tiwari, Jeet Gannguli, Ghoshal's contemporary singers Papon, Palak Muchal, Sukhwinder Singh, Bombay Jayashri, Javed Ali, Neha Kakkar, Richa Sharma, Pakistani singers Ghulam Ali, Rahat Fateh Ali Khan, Asrar, A cappella band Penn Masala, film actress Dia Mirza, cricketer MS Dhoni. 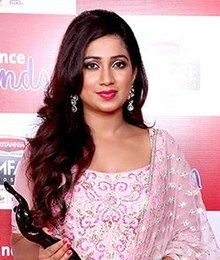 Film makers Vishal Bharadwaj, Karan Johar, and Vidhu Vinod Chopra, have picked Ghoshal as the best female singer from the generation. Singer Kanika Kapoor, a Canadian singer Nesdi Jones, UK singer Roma Sagar, British Indian singer Tripet Garielle, Ananya Nanda, mentioned Ghoshal as their inspiration.